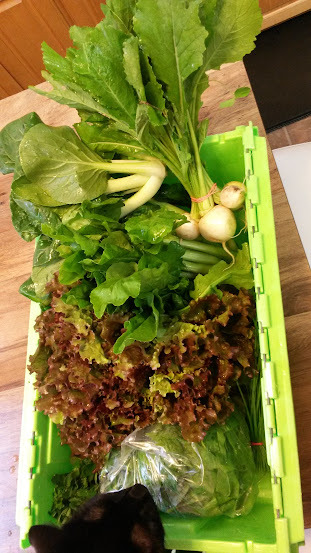 Since about the first of June, I’ve been signed up for Farmer Dave’s CSA. This is our fifth or sixth year as Farmer Davers, and the first year I’ve been able to stomach the thought of extending the season into the late fall share. (It’s a sign your CSA is working on changing your eating habits when you’re tempted to keep it going because broccoli.) Every week, when I get that ginormous box of farm-fresh produce, I have this mental dialogue as I put it away. Hippy Brenda: Oh! Arugula! Let’s make lots of salads this week! Skeptical Brenda: You’re gone for like three days this week, and Adam isn’t going to make salad. You might as well kiss this arugula goodbye. Homesteader Brenda: I bet there are some great arugula pesto recipes out there. I could just spend the next three hours whipping up a batch of arugula pesto to see us through the winter. Sleepy Brenda: It’s already 11 pm. Seriously? Liberal Guilt Brenda: How can you contemplate wasting arugula? Don’t you know that most families across America lack access to affordable healthy food? There are people out there who work three jobs and just DREAM of arugula! And don’t get me started on food insecurity in Africa. You better enjoy this arugula, because you are darn lucky to have it. Practical Brenda: Let’s compromise. We’ll wash & spin the arugula, beet tops & red lettuce together in salad mix, and cram it in the left drawer which almost still closes. Then in the off chance we can find a time for salad, at least we have the salad fixings. Repeat for an entire crate of luscious produce. Of course, then there are the _other_ bits of produce. Let us take kohlrabi as an example. Kohlrabi grows amazingly well in New England. You just think about kohlrabi while looking at a patch of soil, and it starts growing. 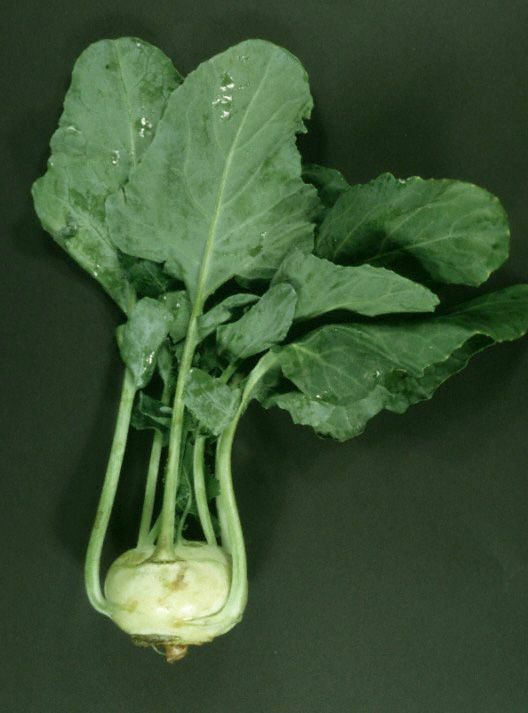 Kohlrabi is what we call “edible” which means that if you can deep fry it in butter the butter tastes good. I have yet to find a recipe improved by the addition of kohlrabi (after six years of trying) and have frankly given up. My new goal with kohlrabi is plausible deniability. My favorite technique in this regard is to put it on the counter and ignore it until it goes bad. Kohlrabi, of course, requires about three straight weeks of ignoring before I don’t feel too guilty composting it. What you bring to parties when you have a veggie share. Everything but the carrots was seasonable farm share produce. In truth, I think the farm share has fundamentally transformed the way my family eats. If you ask my children for their favorite vegetable, they cheerfully profess a string of vegetable-adorations. Spending week after week wracking your brain for yet another use of arugula (see also: romanesco, cabbage) you develop a much more robust repertoire of veggie heavy dishes. You serve your children (and, let’s be honest, your husband) vegetables over and over again in desperation, and on some glorious day those veggies go from despised to a favorite. (True fact: Thane loves cooked collard greens! Grey adores broccoli, even raw!) 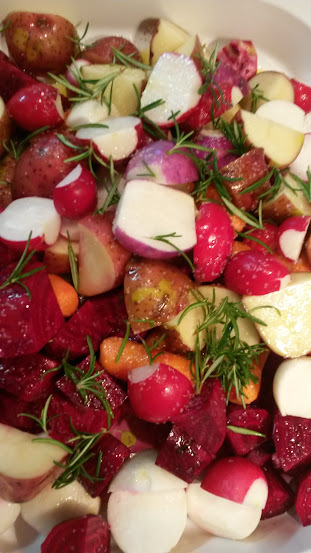 Last week, at our last pickup, I found myself thinking “yum!” at almost all the produce (there was no kohlrabi). 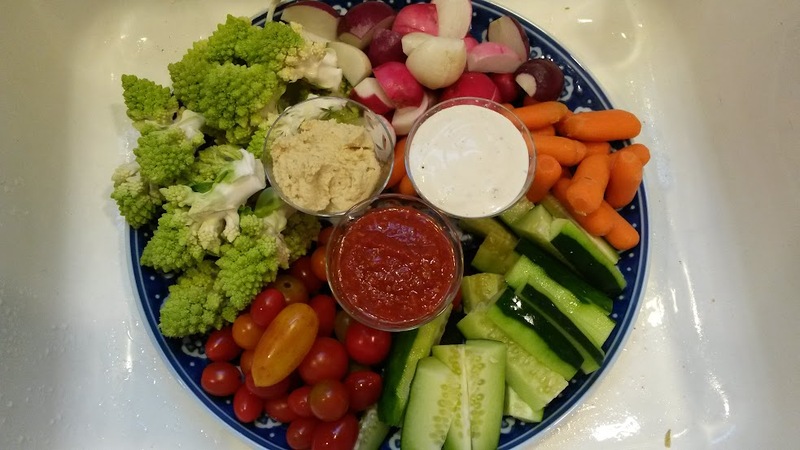 That’s a huge improvement from my attitude toward veggies ten years ago! Farmer Dave reckons he saves us something like 30 – 40% over buying the produce in a store. There are several ways in which this is a completely useless calculation. For example, I have never once seen some of my favorite veggies in a store. Romanesco? 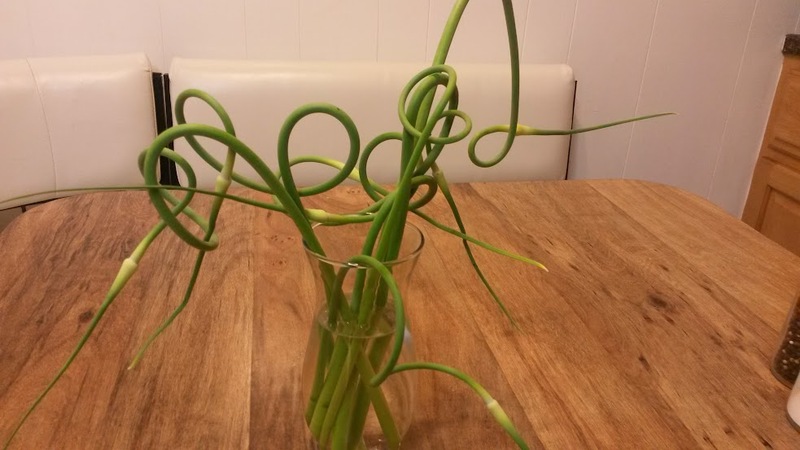 Garlic scapes? Purslane? Amazingly, Stop & Shop does not stock these delicious offerings. (Of course, they’ve also never inflicted kohlrabi on me.) But it’s very difficult to use all your weekly onslaught of produce. (Did I mention we got fresh sweet corn in NOVEMBER this year?! Craziness!) I would never, in the normal course of things, buy nearly as much produce as Farmer Dave brings me every week. And that’s a bit of the point, my friends. We eat SO MUCH MORE produce in order to be able to see the fridge light again than I normally would. And that’s great for all of us. I adore garlic scapes. They’re basically scallions, but for garlic. Also, they look like hydra heads. So if you’re interested in kohlrabi, contact me and I’ll send you mine. Otherwise, if you’d like romanesco, herbs, root veggies, garlic scapes, greens and a wide variety of foods-not-found-in-stores, now is the right time to sign up for the 2015 Farm Share! I find the small vegetable share is enough, and I combine it with a fruit share. (Mmmmm fruit.) Farmer Dave has pick up locations all across Massachusetts. If you aren’t near Farmer Dave, there are CSAs available in most regions now! Ooh look! Is that arugula?! Meanwhile, I’m personally looking forward to a few months where the only produce in my crisper is stuff I actually bought on purpose and know how to use. We get to eat asparagus (which Farmer Dave does not yet produce) and tropical fruits! I can buy frozen veggies that are pre-cut! I know that by June I’ll be dying for some fresh local goodness, but for now… bring on the bagged spinach! 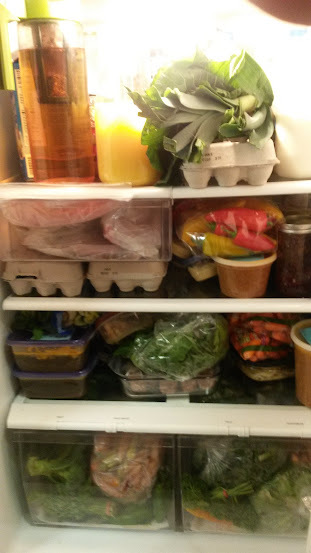 This was one of my favorite posts, especially since I participate in the utilization of the produce each time I visit and the reorganization of the refrigerator in hopes of fitting the next farm share. Nothing quite like farmer Dave’s here. Most on offer is what I can get at Aldis. Enjoy. 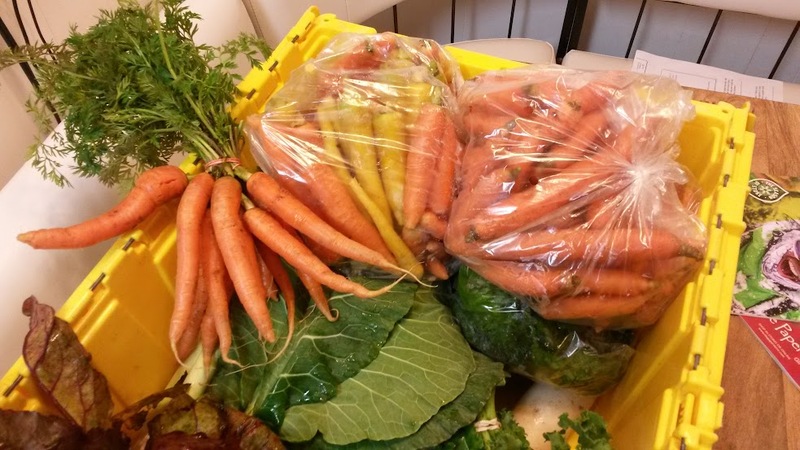 There are farm shares in your area – just none of them the right size for one person, or quite close enough!